MANHATTAN—Past a crush of tourists posing delightedly in front of Wall Street’s “Charging Bull,” a small crowd gathered around the “Fearless Girl” statue as lawmakers and childhood sexual abuse survivors called for passage of the Child Victims Act. 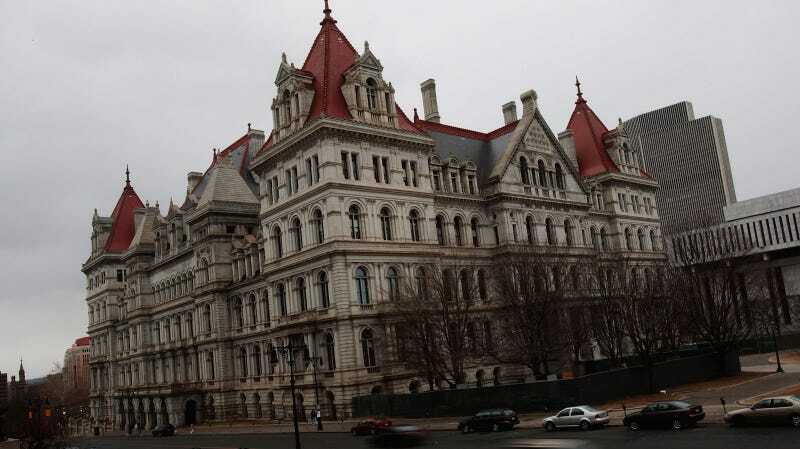 Repeatedly derailed over the years in the New York State Senate, the CVA would lift the state’s five-year statute of limitation on childhood sexual abuse, which requires most survivors to take legal action by the age of 23—although many survivors, out of fear or shame, don’t speak out until decades later. The bill would also create a one-year civil “window” for survivors over 23 to bring cases retrospectively, and would remove the 90-day notice of claim requirement that protects public institutions from being held accountable past that time frame. The Fearless Girl’s questionable corporate roots notwithstanding, advocates leaned heavily on the message of standing up to powerful interests. The state of New York has fallen far behind the majority of the country with one of the narrowest windows for victims of childhood sexual abuse to bring civil or criminal charges—a notable gap that’s come under scrutiny alongside reports of abuse at elite schools like Choate and Horace Mann, as well as horrifically widespread claims of child sexual abuse against Catholic priests. Last week, the New York Daily News reported that Senate Republicans sent the legislation to the Rules Committee in order to avoid a vote. “The State Senate spat in the face of survivors last week,” CVA sponsor Sen. Brad Hoylman shouted hoarsely at the presser. Republicans control the Senate by a slim margin in New York, aided by rogue Democrats in the Independent Democratic Caucus; the state Catholic Conference, which strongly opposes a one-year lookback, has spent millions over the years lobbying to block versions of this bill from passage. Bridie Farrell, a former speed skater who in 2013 accused three-time Olympic speed skater Andy Gabel of sexually abusing her when she was 15 and he was in his 30s—Gabel admitted to the Chicago Tribune of having had a “brief, inappropriate relationship with a female teammate” shortly after Farrell’s public accusation, and was stripped of his membership to US Speedskating—described “ebbs and flows of various darkness and a lot of depression” following the abuse. Coming at the tail end of Sexual Assault Awareness Month, the presser was held to shine a spotlight on the issue and to put pressure on Gov. Andrew Cuomo, who announced in January that he would prioritize moving forward a version of the Child Victims Act but has yet to introduce legislation. At this event, at least, Cuomo, who appears to be mulling a rather upsetting 2020 presidential bid, was regarded as trustworthy on the issue. State Assembly member Linda Rosenthal, who has put forward her own version of the Child Victims Act, said she’s “hopeful” that Cuomo will move on it soon. “I’ll give him room because we just went through a tumultuous budget season, but now is the time for him to come out and work with the survivors, and I know his staff is talking to them. I feel that he has a real commitment to this,” she told Jezebel. Survivor and investigative journalist Stephen Jimenez, who also spoke at the presser, agreed. “Governor Cuomo is Catholic and I applaud him for being willing to stand behind the morally right thing to do on this issue,” he said. Jimenez was offered a settlement by the Xavarian Brothers after he reported years of childhood sexual abuse by a Holy Name of Jesus Elementary School teacher named Brother Romanus, who has since died. He suffered from depression and suicidal thoughts, and didn’t make his allegations public until decades later. Victims “become silent for a period of time due to the trauma,” Jimenez said during his remarks, and “the law then penalizes us for remaining silent.” After chatting with me for a few moments afterwards, Jimenez held out his hand and asked me to feel it.